How Can We Turn “Cold” Pancreatic Tumors “Hot”? Pancreatic cancer remains a challenging disease to treat, with a five-year survival rate of less than 9 percent, according to recent statistics. Unlike many other cancers, which can now be treated with checkpoint blockade immunotherapy, pancreatic cancer often does not respond to this type of treatment. 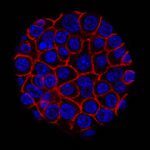 One potential reason for this lack of efficacy is that pancreatic tumors tend to be nonimmunogenic, meaning that the cancer fails to elicit a strong immune response.